as Jupiter by the Romans. in direct conflict with that of Zeus. The boat on which the prisoner Paul left had a figurehead of the 'Sons of Zeus', or the ‘Dioscuri’, the twins Castor and Pollux (Acts 28:11). It was commonly believed that these divinities, considered outstanding sailors as they had power over the wind and waves, demonstrated their protective powers in the form of St. Elmo's fire, an electrical light phenomenon which appears at times at the top of a ship’s mast. 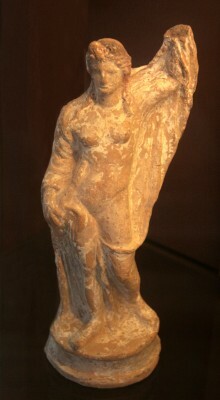 which Zeus came to Leda. the final chapter of the Theogony. An explanation for the origin to the Greek myths ? “In the Pantheons of Greece and Rome, and in that of Chaldaea, the same general grouping is to be recognised; the same genealogical succession is not unfrequently to be traced. This resemblance is too general and too close in some respects, to allow of the supposition that mere accident has produced the coincidence”. “The striking resemblance of the Chaldaean system to that of the Classical Mythology seems worthy of particular attention […]. and explanation from Chaldaean sources.